Cellist Bjorn Ranheim was appointed to the St. Louis Symphony in September of 2005, holds the principal chair of the Colorado Music Festival in Boulder, Colorado, and is a member of the Sun Valley Summer Symphony in Idaho. 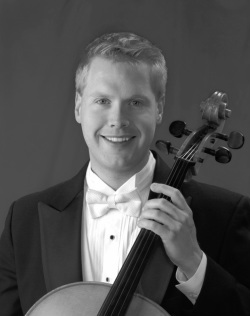 Prior to these appointments, Mr. Ranheim served as associate principal cellist of the Fort Worth Symphony. He has performed and toured with the orchestras of Atlanta, Baltimore, Cleveland, and Detroit; collaborating with Michael Tilson Thomas, David Robertson, Robert Spano, and Bernard Labadie. Mr. Ranheim has held principal and assistant principal cello positions with the New World Symphony, National Repertory Orchestra, Aspen Festival Orchestra and, at the invitation of the music director, Quebec City’s critically acclaimed Le Violons du Roy. Mr. Ranheim made his concerto debut with the Minnesota Orchestra in 1996 as winner of the Young Peoples Symphony Concert Association Competition and has since appeared as soloist on multiple occasions with the Colorado Music Festival, New World Symphony, Columbia Civic Orchestra, and the National Repertory Orchestra. Concerto highlights include Brahms’ Double Concerto with St. Louis Symphony violinist, Shawn Weil and the Washington University Orchestra in December 2013 as well as Saint-Saens’s Cello Concerto with the St. Louis Symphony on a special event performance in May 2014. Actively performing in chamber music, Ranheim has toured extensively in the United States, Europe, and Central America, with performances at Carnegie Hall, Boston’s Gardner Museum, El Teatro Nacional de Costa Rica, and the Guggenheim Museum in Bilbao, Spain. He has participated in the Isaac Stern Chamber Music Seminar, Costa Rica International Chamber Music Festival, Amelia Island Chamber Music Festival, Audubon Quartet Seminar, and has been a frequent guest artist at the National Flute Association Convention. Mr. Ranheim is highly visible throughout the St. Louis region presenting recitals, chamber music performances, and educational concerts, and is a member of Washington University’s Eliot Piano Trio with STL Symphony Concertmaster David Halen and pianist Seth Carlin. In the spring of 2011, Mr. Ranheim was featured on the famed radio program A Prairie Home Companion with Garrison Keillor, performing alongside jazz vocalist Erin Bode, with whom he tours regularly. Ranheim has shared the stage with jazz greats Branford Marsalis, Christian McBride, and Peter Martin, and is a founding member of the 442’s, an exciting acoustic string group exploring the boundaries of jazz, folk, and classical styles. A committed advocate of contemporary solo and chamber music, Mr. Ranheim has premiered works by Stephen Paulus, Paul Schoenfield, Steven Heitzig, Peter Martin, Stefan Freund, and William Beckstrand. As a mentor, coach and performer, Mr. Ranheim has been invited to work with the New World Symphony, Indiana University Summer Music Festival, and the St. Louis Symphony Youth Orchestra. Bjorn Ranheim studied at The Cleveland Institute of Music under the tutelage of Stephen Geber, retired principal cellist of the Cleveland Orchestra.